Under the hoods, so to speak, of the wide range of home appliances that we rely on every day are the motors that make them run. Just like with a car, the quality of a device’s motor will directly affect its performance and efficiency, and can ultimately determine the length of its lifespan. Samsung Electronics’ home appliances, including its latest washing machines, feature innovative motors that foster efficient, reliable long-term performance. Let’s take a closer look at the various types of Samsung Digital Inverter Motors that power the company’s industry-leading home offerings. Samsung’s Digital Inverter Motors, which include Direct Drive, DD PLUS and Spoke Motors, are optimized to meet the needs of various products, including washing machines. Direct Drive Motors (“DD Motors”, for short) connect directly to a washing machine’s load—without the need for complicated transmission—and provide high torque. 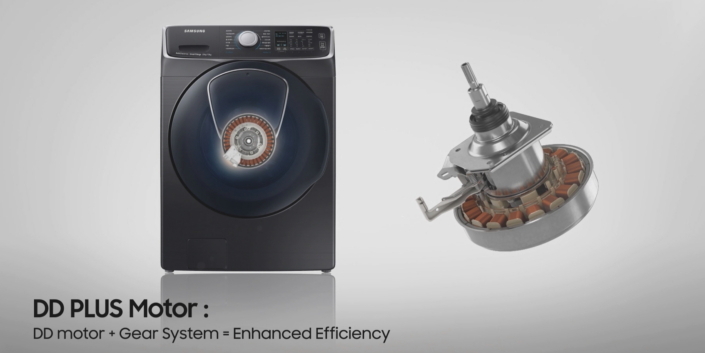 These powerful and efficient motors are featured in Samsung’s mid-to-large front-load washers. 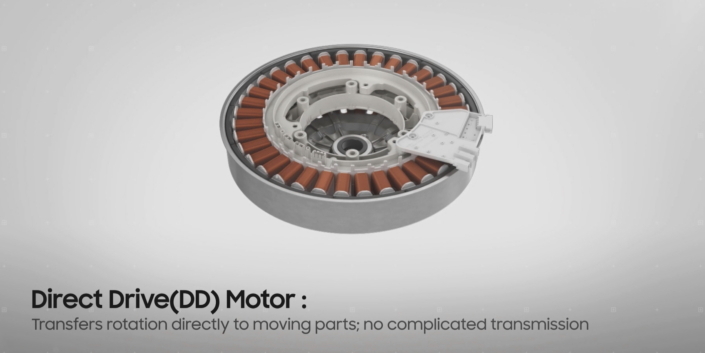 The DD PLUS Motor adds a geared system to the DD Motor, which maximizes efficiency. It’s utilized in top-load washers that require rapid, repetitive, yet efficient motion. Spoke Motors offer strong force and energy-efficient performance, and take up less space than other motors. Initially, they were featured mainly in hybrid vehicles. However, that changed in 2012, when Samsung successfully designed the world’s first high-speed Spoke Motor for use in home appliances, and began to integrate the groundbreaking technology into its washers, dryers and air conditioners. 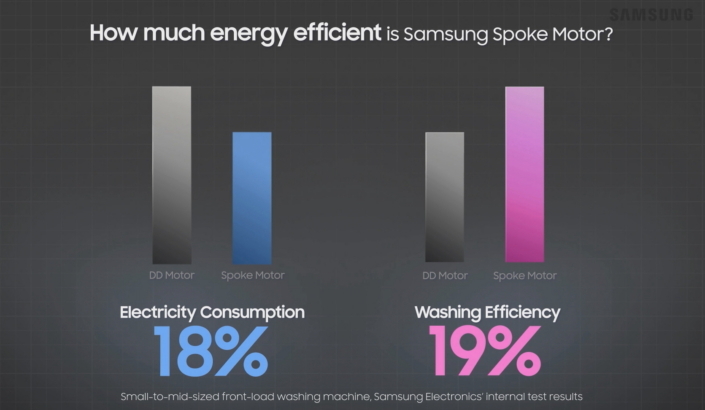 Samsung’s gear-driven Spoke Motors significantly improved both the energy and washing efficiency of its small-to-mid-sized front-load washers—by 18 and 19 percent, respectively*. The motors’ smaller form factor enabled Samsung to equip the washers with larger tubs than would be possible with a conventional DD Motor. This allowed the machines to handle larger loads while maintaining efficiency. In addition to enhancing its washers’ efficiency, Spoke Motors have allowed Samsung to reduce the amount of noise that the machines produce when running. 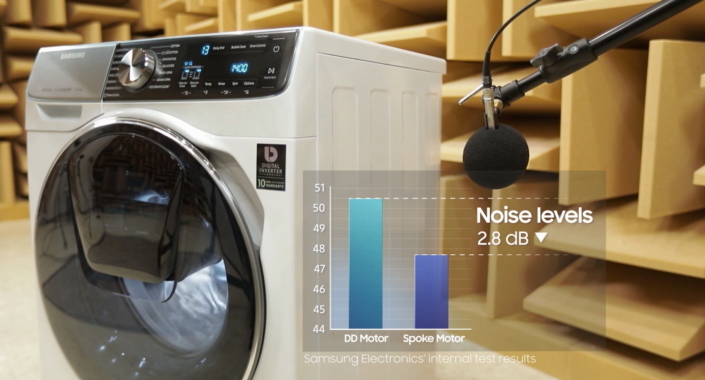 Whereas washers with conventional DD Motors produce noise levels measuring 50.5 decibels (dB) on average, Samsung’s Spoke Motors tend to be roughly three decibels quieter than their “DD” counterparts*. Samsung’s Spoke Motors have also been proven to be exceptionally reliable. 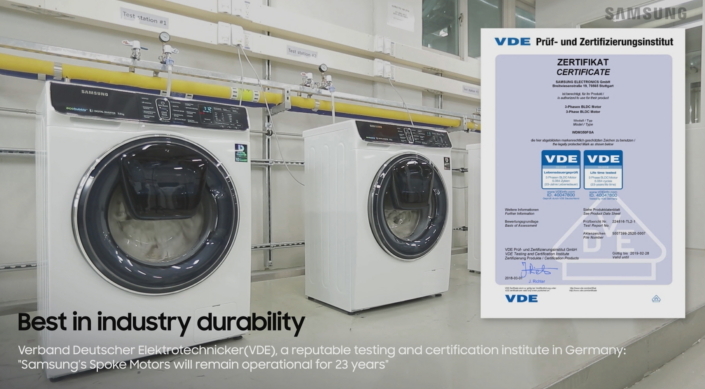 In fact, VDE (Verband Deutscher Elektrotechniker), a world-renowned electronics testing and certification institute, has certified the motors for a 23-year life span. That’s the longest in the world for a washer motor. 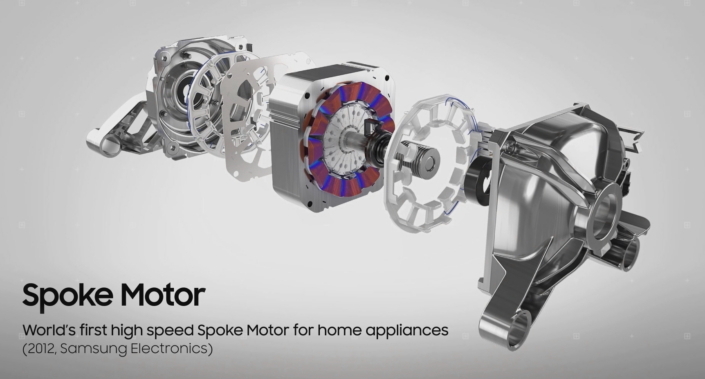 Samsung Electronics’ industry-leading motor technology has helped the company design high-performance, energy-efficient appliances that allow users to enjoy new levels of convenience in their daily lives.